We make frequent trips to the North End, and have walked past Neptune Oyster for years. 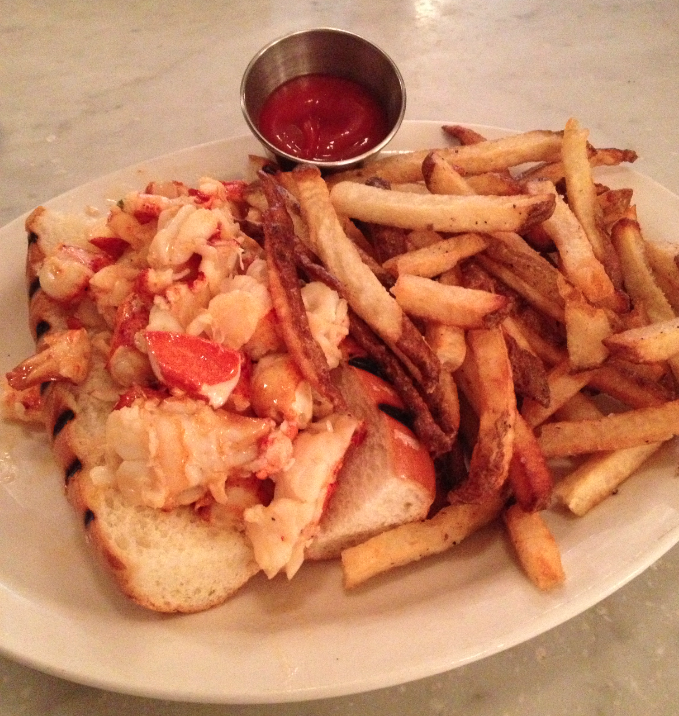 Many, many people rate Neptune as one of Boston’s best lobster rolls, so when we started chronicling our lobster roll adventures we knew Neptune was on the short list. We initially tried them on Labor Day, but found them closed. Recently we circled back on a rainy Sunday morning to find a line of about 20 people waiting Neptune to open. Listening to people’s conversation, it seemed that most of them were first-timers, having been told that, while in Boston, you need to hit Neptune. Needless to say, we were excited to finally check Neptune off our list. We realize that many people will consider this review to be controversial, if not downright blasphemous. But, after spending the summer tasting the best lobster rolls New England has to offer, we can honestly say that this was one of the worst lobster rolls we’ve ever had. Neptune Oyster provides two options – warm with butter, or cold with mayo. We’ve run into this limitation before, and wish there was a third option of warm with butter and light mayo, such as can be found at lobster roll Meccas like Red’s Eats or The Clam Shack. In fairness to Neptune, we each ordered warm with butter, this having been our preference when restricted to this choice, and in retrospect we should have ordered one of each. For all we know, the cold with mayo roll might have been better, but we doubt it. The meat itself was chopped into overcooked, marble-sized pieces so whenever you’d try to take a bit, all the little pieces would literally roll out of the roll. We’ve had much bigger lobster rolls that were much easier to eat. The roll itself seemed pretty good – not the traditional split-top hotdog roll, but a sweeter, softer artisan roll. But we were quick to notice the puddle of reddish liquid pooled underneath the roll, making it somewhat soggy. We also wondered what, exactly, this liquid was. We expected butter, a la Rye Harbor Lobster Pound, but instead got what we thought tasted more like warm water with a slight butter flavor and lobster color. This was pretty horrible and, at a whopping $25 per roll, very disappointing (especially with lobsters selling at around $3.99 per lb). The lobster meat was problematic. We initially assumed that it was over-cooked, but as we forced down the last of our rolls, we realized that this tasted like yesterday’s lobster. Now we’re not saying that we got yesterday’s leftovers… we’re not saying that at all. We’re simply saying is that each of us thought that’s exactly what it tasted like – old, rubbery, just plain bad. In fact, for at least an hour afterward, we still had an awful taste in our mouth, this despite numerous attempts to cleanse our palates with everything from Pellegrino to pistachio macaroons (from Maria’s, of course!). In fact, one of us actually felt a little “off” for a several hours after the Neptune experience. 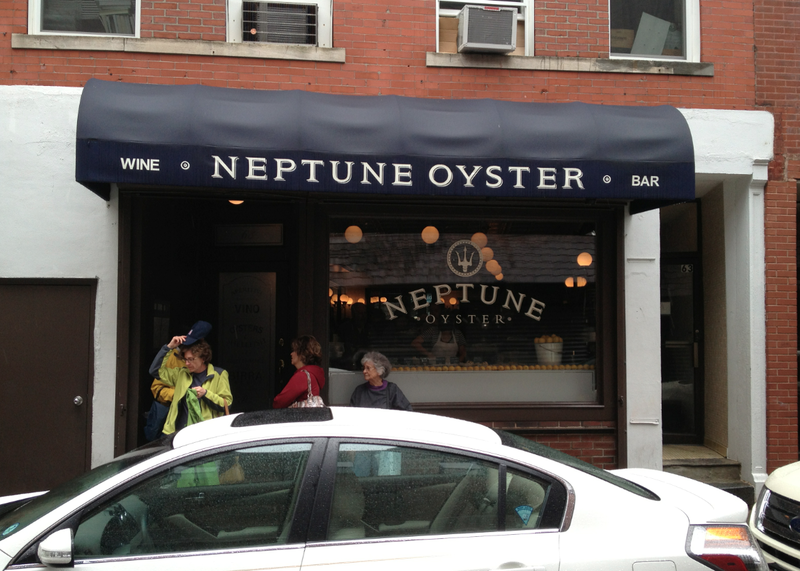 Neptune Oyster can be found at 63 Salem Street in Boston MA. WEBSITE: http://neptuneoyster.com. PHONE: 617.742.3474.